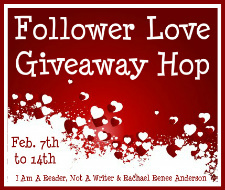 Welcome to the Follower Love Giveaway Hop, hosted by I Am A Reader Not A Writer and Rachel Renee Anderson. This giveaway runs from February 7th to February 14th 2012. There are hundreds of blogs participating, so once you finish here, don't forget to check them out by visiting one of the sites above! I'm sure you're wondering what's up for grabs here! Well, one lucky reader will win a book of their choice up to AU$10 from the Book Depository. This giveaway is International. So long as you are over 13 years of age and The Book Depository ships for free to your country, you can participate. To enter just fill in the Rafflecopter below. When I entered the Follow Via GFC, I accidentally pressed enter too quickly, so I ended up typing "GFC:" instead of "GFC: Debbie W." Sorry for the inconvenience! No problem, Debbie. I've done that before too! Thanks for letting me know. Oooh i love new books :) Thanks for the giveaway! Thank you for the giveaway! And make international! !